Binance is a Hong Kong–based cryptocurrency exchange launched by developer Changpeng Zhao in July 2017. Zhao’s company Beijie Technology created the exchange after a successful ICO that raised $15 million. Beijie Technology and its founder maintain an impressive track record within the industry. Zhao’s CV includes high-profile positions, such as technical director at Blockchain.info, and his company now provides trading systems for over 30 other platforms. Following struggles with the Chinese government’s views on cryptocurrencies, Binance now runs its servers from more lenient states, providing it with the freedom to run a competitive exchange service. “In response to China’s decisions, we are moving our IP’s from Hong Kong to an offshore location. So we are registered in multiple locations and we have people in multiple locations. That way we will never be affected by one regulatory body,” explained Zhao. The trading exchange has been experiencing astounding success since its summer launch, and it now even sits around the top ten in terms of 24-hour trading volumes on Coinmarketcap. 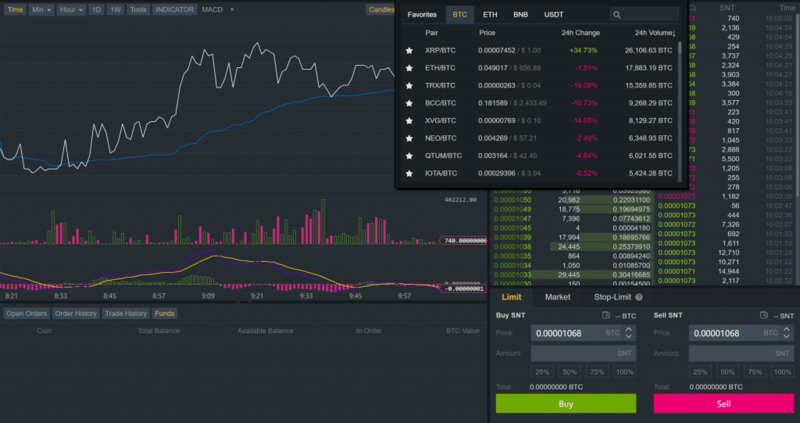 So why is Binance becoming so popular, and is it useful for your cryptocurrency trades? 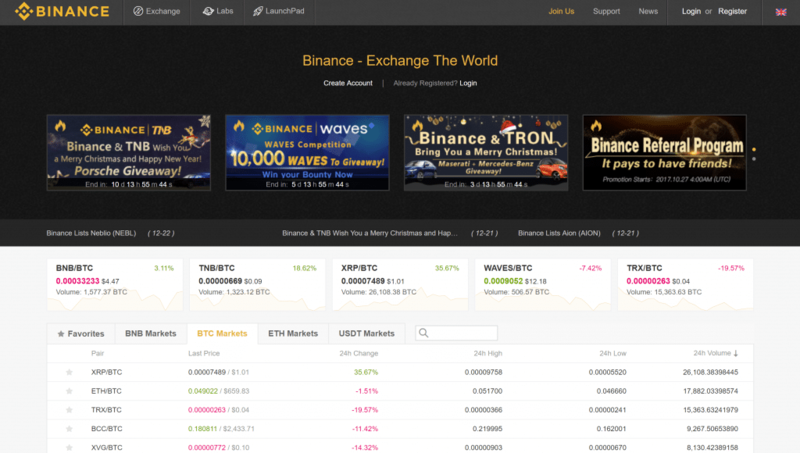 Binance offers a crypto-to-crypto exchange, meaning that it doesn’t facilitate any fiat currencies. This allows the platform to work freely, steering clear of any red tape or regulation (for now). There’s an impressive cryptocurrency selection on offer in conjunction with the Bitcoin, Ether, Bread, and Tether trading pairs. All in all, the number of coins available is nearly 100, and all major altcoins, including Litecoin, Ripple, and Bitcoin Cash, are in the listing. Adding to this is a neat roster of up-and-coming altcoins. In a competitive space, the fee structure on Binance is cutting edge. Its team members have sharpened their knives and are slicing the opposition apart. A flat rate of 0.1% is very enticing for any trader who doesn’t need immediate fiat liquidation. Incredibly, it undercuts most other large exchanges, some of which charge upward of 0.2%. That’s a pretty sizeable difference if you’re working with large orders. For the time being, BNB, the native Binance token, even provides a 50% discount on this trade fee when working with the coin. Deposits are free, as you’d expect (it’s generally the sending wallet that pays blockchain fees with cryptocurrencies). Withdrawal fees do apply, although they generally correlate with the blockchain transaction fees. The withdrawal fee seems to be updated on a regular basis to try and offer a fair price. At the time of writing, a Bitcoin withdrawal costs around $8, while a Litecoin withdrawal is around $0.33. It’s a sign of the times for Bitcoin. It’s a good idea not to move Bitcoin around if possible, as it will eat into your profits; try to use faster and cheaper options such as Litecoin if you can. Binance does an adequate job in terms of its customer support. Most inquiries need to be made via the site’s email contact form, and after that, it’s simply a matter of waiting. As with most major trading exchanges, you may have to wait awhile for a response simply due to the sheer growth in demand. There is a Wechat customer service QR code to tap into that may help via a quick live chat, but some of the responses are automated (and in Chinese). On testing the Wechat, I originally received an automatic reply pointing me to support page links. Five minutes later, another notification revealed what seemed to be an actual person on the other end. My Chinese wasn’t good enough to decipher the messages without Google Translate, but it all seems legitimate. Happily, the website is completely multilingual, so most people should get along fine in one language or another. 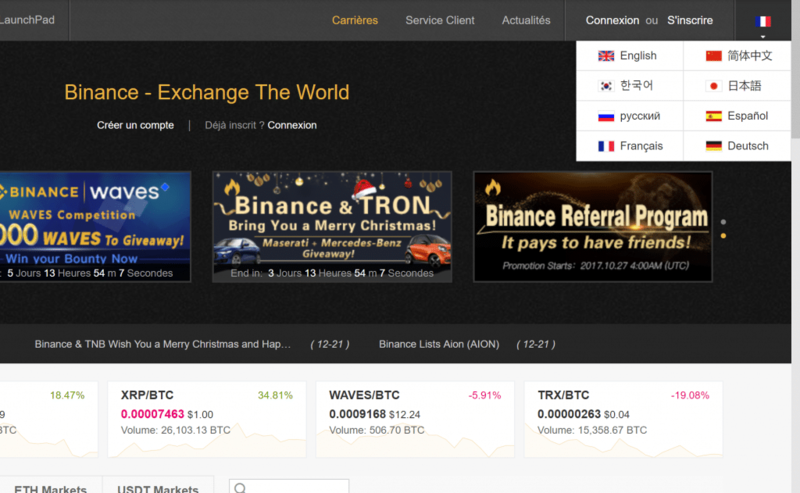 English, French, Spanish, German, Korean, Japanese, and Chinese are all options on the exchange. This is another real advantage for Binance as it seeks to compete as a global cryptocurrency exchange. 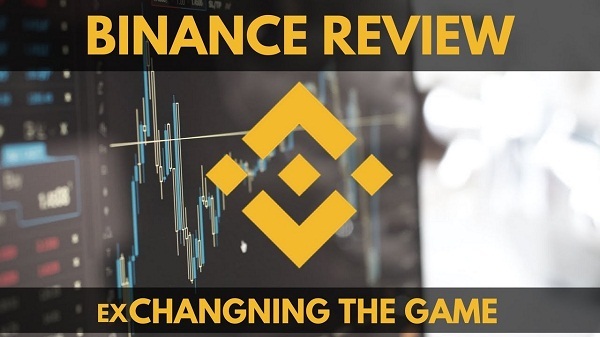 There’s a lot to love about Binance, and many traders continue to be upbeat about the service. Low fees, a responsive exchange, and developers with a proven track record leave most people beaming.  Binance has generally been considered a comprehensive success in its short life so far. One thing to keep in mind is that Binance offers an affiliate program, which gets a lot of people to speak highly of it while trying to push their affiliate links to earn some extra cash. Take every positive review you read with a grain of salt if it’s accompanied by an affiliate link. 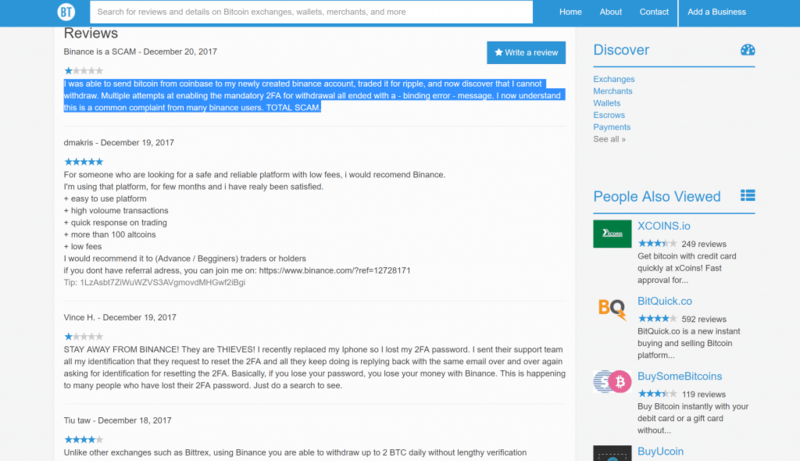 One major problem does appear to be a thorn in the site’s side: Many reviews complain about a faulty 2FA/SMS confirmation. The temperamental nature of this setup for Binance means that a few customers struggle to withdraw funds. In fact, it’s such a problem that scam allegations have been pointed at the service. To be honest, dodgier prospects exist across the industry, and I see this as more of a technical issue than a scam. It’s probable that this hiccup will be ironed out in 2018, after which I expect the Binance exchange to drive to an even higher market cap. Conclusion: Is Binance a good exchange? When we pull everything together and look at Binance objectively, the pros far outweigh the cons. This is more than can be said for some other competitors. The exchange’s low fees combined with the team’s proven knowledge of how to build a trading platform is enough to make it a major player. It’s no wonder that success followed the service during its opening months. Add to this the ability to offer a truly worldwide service away from the grip of the Chinese government, and there’s not much to stop Beiji Technology.